Giant Surf Labels- Cow-a-bunga Dude! Look out for that wave! 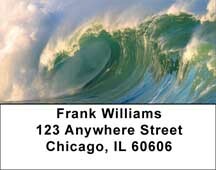 These fast moving Address Labels are a great way to show your love for surfing and the ocean. Four jaw dropping photographs of insane waves will get wishing you were on a plane to Hawaii. Giant Surf Checks- Cow-a-bunga Dude! Look out for that wave! These fast moving personal checks are a great way to show your love for surfing and the ocean. Four jaw dropping photographs of insane waves will get wishing you were on a plane to Hawaii.